US #2482 was issued on this day in 1990. 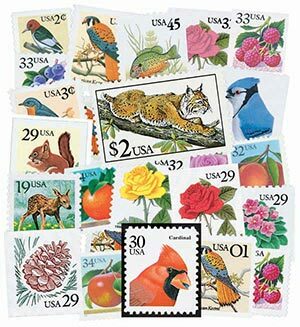 On June 1, 1990, the USPS issued the first stamp in the Flora and Fauna series. The Flora and Fauna series was born from plans for a Priority Mail stamp in 1987. At the time, the USPS was considering what to feature on their new Priority Mail stamp. Express Mail stamps at the time pictured eagles, so they thought Priority stamps could picture fast land animals. 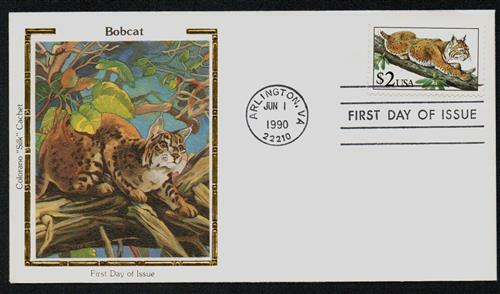 US #2482 – Silk Cachet First Day Cover. The USPS then tasked three artists with providing some wildlife artwork for consideration. However, they didn’t act on the artwork and filed it away. The following year, the USPS did use one of the pieces, a pheasant painting by Chuck Ripper, for a stamp needed for the new 25¢ first-class rate. US #2482 – Fleetwood Plate Block First Day Cover. By 1990, the USPS was ready to replace the Great Americans series, which had begun in 1980. Early in the year, there was an urgent need for $2 stamps, as their stocks of $2 William Jennings Bryan stamps was depleted about six weeks before the new stamp was issued. The USPS chose another of Chuck Ripper’s paintings, of a bobcat, to grace the new $2 stamp. One thing the USPS knew they wanted to do with the new series was place the higher values on larger sized stamps, to help postal workers more easily distinguish $1, $2, and $5 stamps from 1¢, 2¢, and 5¢ stamps. They considered using the special-issue size used for Christmas and Love stamps but ultimately decided to go with the regular commemorative size “to give the collector and the user of these stamps more for their money” according to one USPS official. US #2476//3494 – Get the complete set of 55 Flora and Fauna stamps in one convenient set. 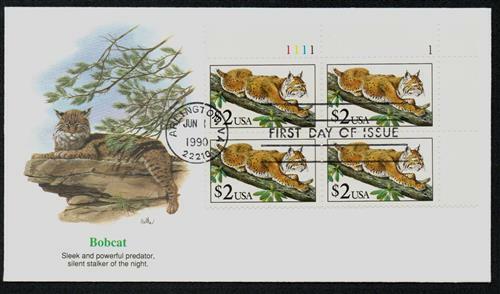 Similar to the $5 Bret Harte stamp, the $2 bobcat was issued in a mini-sheet of 20. 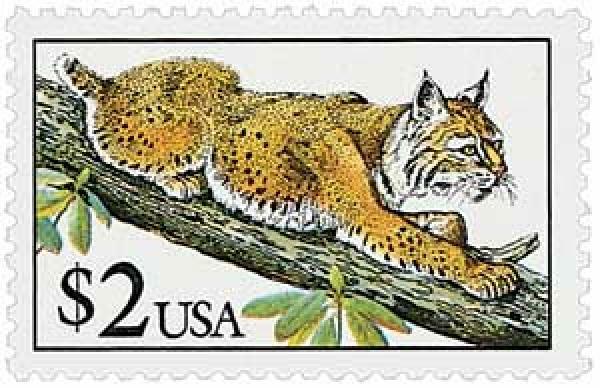 The selvage including the words “American Wildlife” and “Bobcat (Lynx rufus),” though the animal wasn’t identified by name on the stamp. US #2476 is an example of a stamp with the leading zero and no cents sign. US #3032 is from after the USPS reinstated using the cents sign. 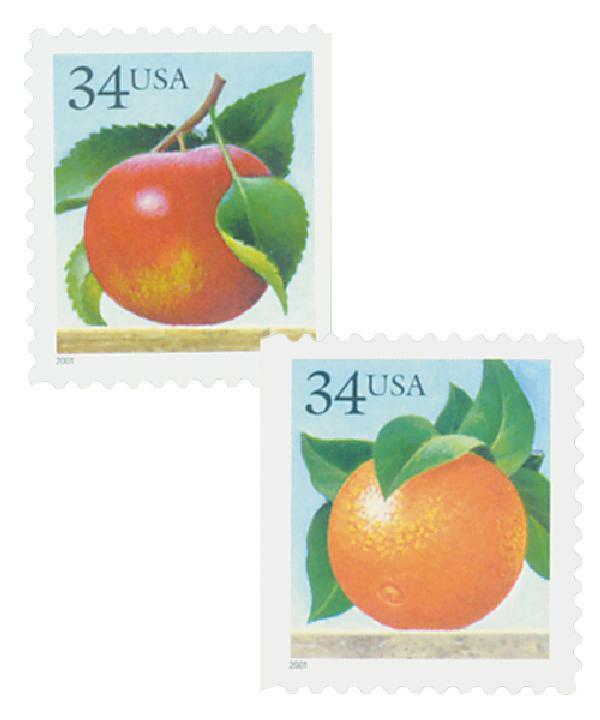 In 1991, lower-value definitives were needed, and the USPS made a break with tradition. Going forward, all values less than 10¢ would have a zero before them and no cents sign. However, in 1995, they reversed that decision, and went back to using a cents sign without the leading zero. Item #MP1428 – Get 600 worldwide Flora & Fauna stamps for just $17.50! For most of the series’ life, it was referred to as the Wildlife Series. 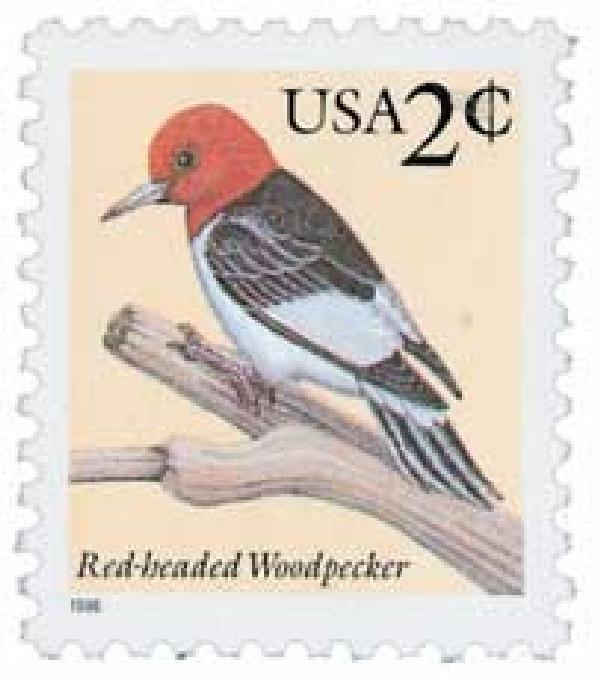 Then with the issue of the 2¢ Red-Headed Woodpecker on June 22, 1999, the USPS began calling it the Flora and Fauna Series. 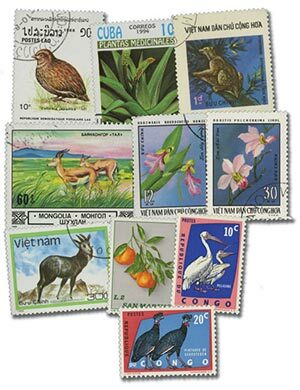 Over the course of the series, there were 36 face-different stamps (55 in all) that pictured a wide variety of flora and fauna. The flora included flowers, berries, fruit and a pinecone, while the fauna consisted mostly of birds as well as a fawn, squirrel, honeybee, fox, and sunfish. The tulip stamps used the rate-change F denomination. These stamps were issued in a variety of formats – sheets, booklets, coils – and as perforated with water-activated gum or with straight edges or serpentine die cuts with self-adhesive gum. US #3493-94 was the last stamps issued in the series, in May 2001. 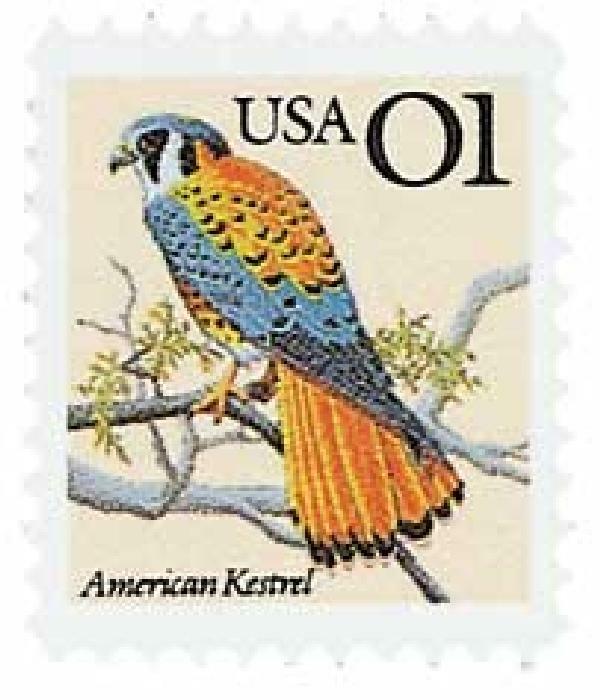 The first Distinguished Americans stamps were issued to replace this series in 2000, and the final Flora and Fauna stamps were issued in May 2001. Click here to get the individual Flora and Fauna stamps you need. This entry was posted in June 2018, This Day in History. Bookmark the permalink. One Response to "This Day in History… June 1, 1990"